K im free to do stuff, finished my side projects (And am home) so Ima get started on converting the Exporter located in the UIEditor, to the best of your knowlege is there anywhere else for compatibility sake I should worry about converting? Hey, I've looked in the example code for custom stylesheets and can't figure out how to import them or use them. Have they been removed in 0.6 completely or did you just change how they work? 1. Add combobox with language selection(C# or VB) to the ExportOptionsDialog. 2. Create ExporterVB based on ExporterCS. Actually If I had enough time, I'd try to create language-agnostic BaseExporter and made ExporterCS/ExporterVB it's inheritors. I changed how they work. Prior to 0.6 the Content Pipeline had been used, but it was removed afterwards. CustomUIStylesheetSample works, however it's code may be slightly confusing as it uses multiple Myra utility classes which arent documented. 1. All custom stylesheet assets are stored as resources. I've already documented what is ColorBuffer and SpriteFontHelper. However rest of used utilities(TextureRegionAtlas and AssetResolver) arent documented yet. But documentation for how-to load custom stylesheet has almost top priority in my list. Also it's important to note, that you dont need to copy the whole above code to make custom stylesheet loading. You're free to feed it images/sprite fonts, that were loaded using any possible way(i.e. through Content Pipeline, or Texture2D.FromStream). No, there shouldn't be conflicts. There is some crossing functionality. I.e. both MGE and Myra have TextureAtlases. However classes naming are different. MGE's classes are named TextureAtlas/TextureRegion2D/NinePatchRegion2D. While Myra's classes are TextureRegionAtlas/TextureRegion/NinePatchRegion. Also I've borrowed ShapeExtensions from MGE. FileDialog is part of Myra.Editor.dll (similar to Myra.dll, it could be installer either through NuGet or directly referenced from the distribution package). New widget usage is demonstrated in the UI Editor, AllWidgetsSample and NotepadSample. 1. Added transparency. Now Widget class has Opacity property which can take values from 0.0 to 1.0(default value is 1.0). If both container widget and its child have that property set then they are multiplied. I.e. if container opacity is 0.5 and its child opacity is 0.6. Then the child will be rendered with opacity 0.3. I want to remind that all samples executables are part of the binary distribution. NuGet had been updated as well. As you can see, Myra is being rendered after everything else (yes, I checked the render order in spriteBatch.Begin(), it is correct.) but yet Myra is still getting rendered under the background sprite. I think, the reason of that issue is Myra using it's own SpriteBatch. So your sprites are rendered when you call spriteBatch.End(), which happens after Myra.Render. That's why your sprites on top of the UI. Thank you for the help! That fixed the issue. 1. Added two more simple widgets: HorizontalSeparator and VerticalSeparator. NuGet was updated as well! The master section of the menu goes the width of my map-board. As you can see I have one master menu option with a sub-option within it. What happens in this case is that every time I make a selection of either menu option, the Update Event is fired, which in turn causes the "Draw Event" to fire, prior to the actual functionality of either menu option taking place. 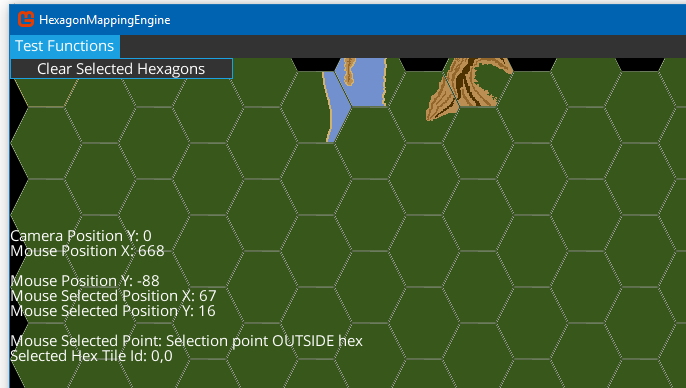 As a result of this sequence of events, the hexagon tile selection task is always being processed, which then causes a highlighted hex to be overdrawn over the original selected hexagon tile in the wrong area of the map board. This is causing processing and screen handling issues since when selecting a menu option in this scenario, I do not want an Update Event to fire. Is there a way to work around this (avoiding the Update event from firing or circumventing it) or have I set up Myra incorrectly for the way I want to use your interface library? Sorry, I didnt understand the issue. Which object fires Update and Draw events? Also what Myra version do you use? The issue I am experiencing is that when a Myra menu option is selected, the MonoGame Engine is also interpreting this to be a mouse-press on the actual map-board or the MonoGame screen. As a result, the MonoGame Update Event is fired, which in turn fires the Draw Event, both of which look to find a hexagonal tile that the user has selected. However, in this scenario I don;t want these processes to run since I am only looking to process the menu option event. How then do I separate the menu option selection from these two event noted above? I got it, you want to suppress MonoGame Engine mouse events if mouse is over Myra menu. Probably easiest way would be to change the Update Event handler to ignore processing if mouse is over one of Myra's widgets. Let me know, if this helped.